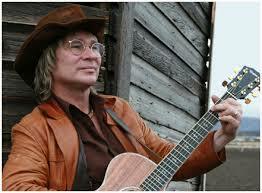 “Country Roads” was actually written by Bill Danoff, Taffy Nivert and John Denver, who was the first to record it in 1971. It became a world-wide hit, and one of Denver’s signature songs. I always assumed that the composers had got their geography wrong in the song when they wrote “Almost Heaven, West Virginia; Blue Ridge Mountains, Shenandoah River.” I figured that the Blueridge Mountains were only in North Carolina and that the Shenandhoah River only flowed in Virginia. Let’s learn to pick a simple version of “Country Roads” on the banjo. If you’re new to my way of writing tab, let me point out that the five horizontal lines represent the strings, which are numbered on the left. Of course, your short string is the 5th string. The numbers on the strings tell you what fret to play on the string. Instead of writing out a complicated banjo arrangement with all the rolls incorporated into the song, I only write out the bare-bones skeleton of the tune. That way, we can “dress” the skeleton with different rolls each time we play it. That means we’ll be improvising and our music still stay new and fresh instead of old and stale. In my way of writing out tab, there’s only two kinds of notes. At the very beginning of line one, you’ll see two notes that are tied together with little lines. These are eighth notes. Everything else is a single note with a vertical stem either pointing up, or hanging down. It doesn’t matter which way the stem points. These notes are quarter notes, and get one beat each. You can decorate those quarter notes with a simple roll that gets one beat. (A beat gets one complete foot tap where your foot goes down and then up). Take a look at measure 1 over the word “roads” and you’ll see 0’s on the 2nd string. You’ll play a Lester Flatt roll two times there. So in that measure you’ll play 2 1 5 and then 2 1 5 again. On the notes that are tied together, just play those notes with no roll. In measure 3 and the first half of measure 4, the melody moves to the third string. Now you will play the Lester Flatt roll that starts on the third string: 3 1 5. The only time where you can’t play the Lester Flatt roll is when the melody goes up to the 1st string, as in measures 7, 8 and part of 9. After each of these melody notes, merely play the 5th string quickly after each melody note. Be sure to play all the notes on the 2nd, 3rd strings with your right thumb. I believe you’ll get the hang of this once you listen to me playing it on the banjo. By the way, you may want to check out my book, Bluegrass Banjo for the Complete Ignoramus (also available as an eBook), where I teach about 20 songs with this bare-bones skeleton approach or my newest book, Bluegrass Jamming on Banjo (also available as an eBook), which has another 30-something songs taught this same way. Of course, each of these books teaches a variety of ways to dress up the naked skeleton of a wide variety of bluegrass, old-time, folk and gospel tunes. You are so right. I have both banjo and Mandolin tabs for the song. country roads, rocky top, foggy mtn breakdown, of course matching banjos. In fact way back in 2000 we did that song at a bar on there deck after people had been drinking and it was one of them hot stickey nights they about torn the bar apart. We were ask not to do that song so late. I like the new web page. Love this thank you! Do you have tabs for the verses too? Please do not remove this site!!! I have been playing banjo now for three years. I am just getting the melody going (with a lot of messing around) I love bluegrass and all that i stands for. Your teaching and learning is spot on and I really like how you are getting people to do the melody and the picking form themselves. I really get it that we can never remember all the songs but we can learn to play like the good old boys. Thanks so much for keeping this alive, I promise to do the same when I get better. Thanks so much Isa. Keep up the good work! Hi! I bought your book Bluegrass Banjo for the Complete Ignoramus and I’m lovin’ it! HI. I’m also a beginner banjo player. 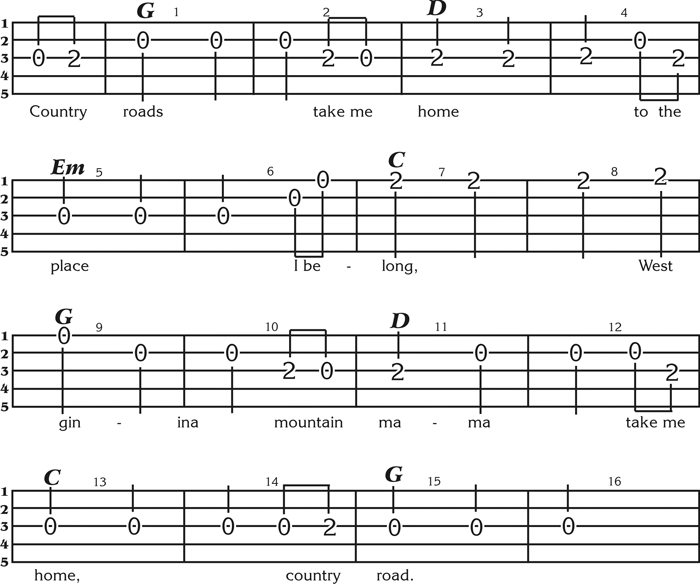 I’d love to get the tablature for the verses of country roads.